Dell’s XPS 10 tablet and Lenovo’s Yoga 11 hybrid with Windows RT have been discontinued, but the companies will provide customers free upgrades to the latest Windows RT 8.1 when the OS is released later this month, according to representatives from the two vendors. Microsoft has said that upgrades to versions of Windows 8.1 will be free, and the company’s Surface RT tablet will also be upgraded to Windows RT 8.1. The other devices with Windows RT include Asus’ VivoTab RT and Samsung’s Ativ Tab, but the companies did not respond to requests for comment on specific upgrade information. Sales of devices with Windows RT have been poor. Some users of Dell XPS 10 have reported issues upgrading from Windows RT to the preview version of Windows RT 8.1, which was released in June. The tablet crashed, or users had to jump through hoops to get the upgrade to work. Some users of Lenovo’s Yoga 11 also reported upgrade issues. There are many good reasons for users to upgrade. Windows RT 8.1 has a more intuitive user interface and an Outlook email client to go with Office Home and Student 2013 RT. Users will also get the latest drivers. The Windows RT tablets run on chipsets from Nvidia and Qualcomm, which required specific code-level modifications for Windows RT 8.1 to work. Both companies have said they are continuing to work with Microsoft to deliver improvements to the tablets. 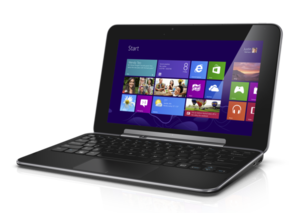 This laptop-tablet hybrid would be a lot more tempting if it ran Windows 8.